When I was told that Karissa Cove had retired from doing craft shows, I didn’t realize just how long she’s been behind a craft fair table. Karissa grew up touring around with her crafty mom. Wow, now I really feel like a newbie to the craft world! I’m extra honoured that she’s coming out of retirement for the Holiday Trunk Show on December 7th, especially since I’m in love with her knitted berets. What is your first ‘crafty’ memory? Karissa : I have a few memorable young crafty memories…I was 3 or 4 sitting on the floor making outfits for my cat, Dudley, out of my mum’s scrap material while she sewed on our kitchen table…making a quilt out of wool scraps while I was about 4….painting my feet green, then crawling around my house on my knees to avoiding leaving green foot prints…. How do you come up with your designs? 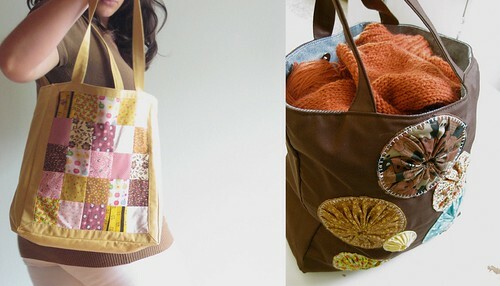 I noticed one of your bags is called the Country Mouse Tote – does your childhood play a big role in your work? Karissa : Yes, it really does, but I think that my whole life plays a role. When I was growing up my mum was a crafter, so I spent just about every holiday season with my mum at craft sales all over Ontario. Once I got a little bit older, I would make little book marks, and other little crafty items to sell along my mum’s crafts. Since I was a child I have understood how to figure out the cost of an item by the materials used, the length of production time, how to make the most of material. Is there a craft or medium that you’ve always wanted to try that you haven’t yet? Karissa : I can’t wrap my brain around crochet! I tried to teach myself from a Japanese amigurumi book and despite all the diagrams I just kept going around and around and ended up with a grey patty instead of a cute Japanese elephant. Do you have any favourite local artists that you really admire? Jen Anisef from Toronto Craft Alert, Dana DeKuyper from Damned Dollies, yarnovermovement, Allison Moyer from Cordially Yours. Karissa : I really don’t need for anything, however, I would like the Martha Stewart circle cutter so I can finally cut a perfect circle out of print making softoleum! Visit Karissa’s etsy shop and her flickr page for more! I had a Karissa Cove bag with me the day I met my boyfriend! what a delightful thing to find through my google alerts! you are mighty inspiring yourself, ms. cove. can’t wait to see you at the show, it’s been too long. Anabela: Ah, that makes my heart melt! Bobbinoggin: aren’t yo-yo-s so vintage-cool? I love jumbo-yo-yo’s! Jen: It has been TOO long. Can’t wait to see you next weekend! Karyn: Thanks so much for the fun interview. Can’t wait to see you next weekend, as well! wow those hats are gorgeous! i’m so excited about all these awesome holiday craft shows! 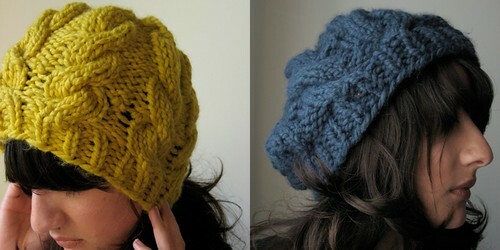 I’m excited about these hats as well, I think I’m going to have to get myself one!